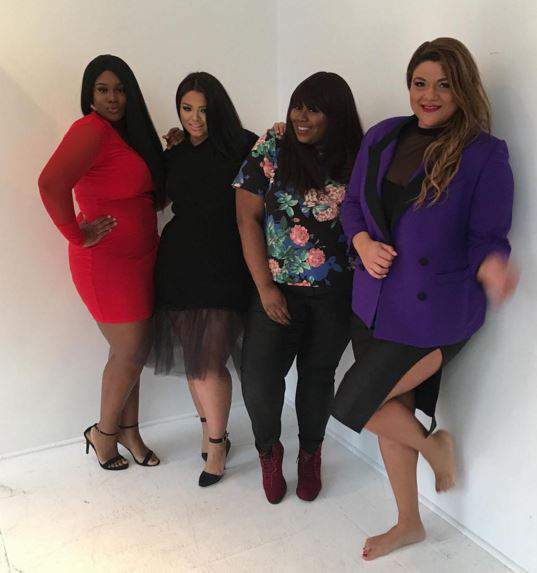 10 Plus Size Stylists That Should Be On your Radar! For the straight size fashion enthusiast, there’s a level of fantasy when watching the red carpet for an awards show but theoretically, if you had the fame, money and prestige, you could recreate almost every red carpet look or at least find a similar silhouette in your size. When you’re a plus size fashion enthusiast, you might watch an entire red carpet without seeing a single celebrity who looks like you. But thanks to plus size celebs like Orange Is The New Black’s Adrienne Moore and Empire’s Gabourey Sidibe becoming red carpet staples, plus size fashion is finally earning its own place on the best dressed list. While some plus size celebs such as Adele, Danielle Brooks and Rebel Wilson have opted to work with stylists who are straight size; others have turned to styling experts from within the plus size community. Many of these stylists have also worked as bloggers or creative directors and have a vast knowledge of the community’s up and coming designers. The relationship between plus size designers and plus size stylists means that designers and brands such as Z by Zevarra, ELOQUII, Zelie for She and more end up getting red carpet recognition. Unlike some of the gowns worn by straight size celebs, many of these plus size red carpet looks or similar ones from the same designer are actually accessible to plus size consumers. And when plus size celebs are styled for appearances and talk shows, the pieces are even more accessible. In honor of this significant shift and recognition of plus size celebrity fashion, I wanted to highlight ten of the plus size stylists who have paved the way and who should definitely be on your radar. Reah Norman is a fashion and product stylist with more than 15 years of experience under belt. You’ve likely seen her work as the Executive Fashion Director of Plus Model Magazine. She has styled shoots for Tess Holliday and a Latin Grammys red carpet look for Chuey Martinez and perhaps most recognizably Ashley Nell Tipton on Project Runway. Norman is also a personal style blogger and her own looks mirror how she dresses her clients: polished, clean and fashion forward. We featured stylist Susan Moses on TCF back in 2010 so she’s definitely been in the game for some time now. Her past celebrity client list includes Queen Latifah, Wynonna Judd, Jill Scott,Kathy Bates, and Nikki Blonsky. And these days, she is still staying busy. She’s styling a NYFW show for PLY Apparel later this month and releasing a book called “The Art Of Dressing Curves” in April. 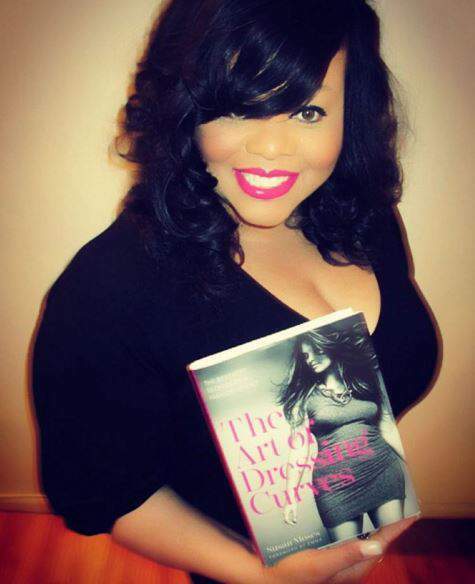 Shaina Harrison is a blogger, stylist, educator and one of our 19 plus size women to watch in 2016. While she’s gained recognition for her #BraveSpace Periscope broadcasts, I have also definitely taken notice of her styling work for Pop Up Plus. She has brought an urban edge and vintage inspired look to the shop’s lookbooks that makes their pieces certainly stand out. One of the most recent plus size red carpet show-stopper moments came courtesy of Meaghan O’Connor of Little Lime Dress. 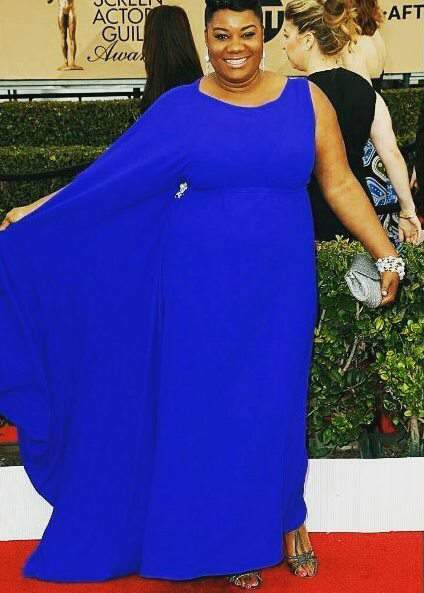 She styled Orange Is The New Black star Adrienne Moore in a custom royal blue gown by Elann Zellie of Zellie for She for the SAG Awards. 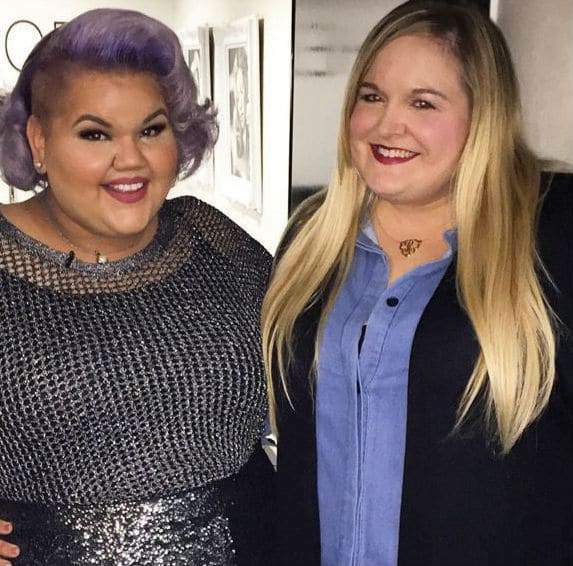 O’Connor, who is also a plus size blogger, also has styled Tess Holliday for television appearances. You can also catch her work in the pages of Plus Model Magazine. With a focus on celebrity styling, her focus is to bring high-fashion trends to the everyday woman. If you take a quick look through stylist Steffany Allen’s Instagram page, you’ll see selfies with some of the styling elite including Rachel Zoe, Ty Hunter, and Brad Goreski. 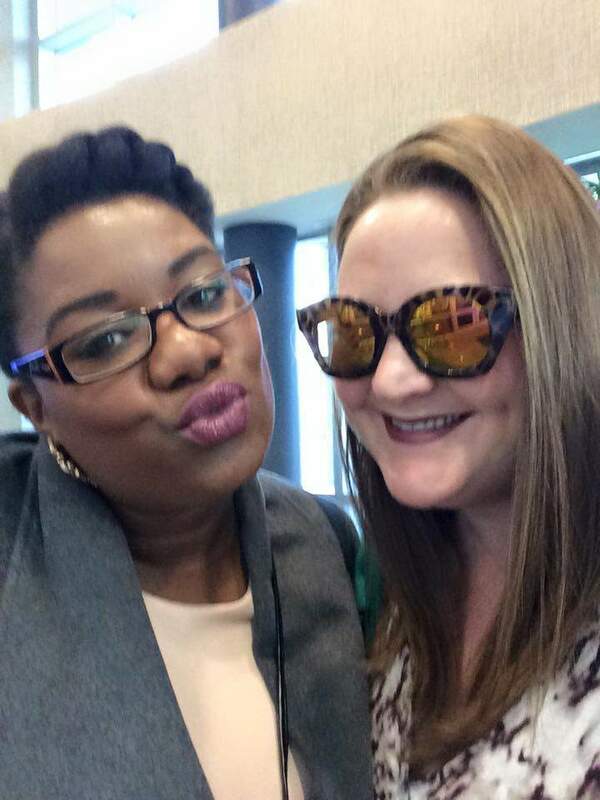 Her client list includes Plus Model Magazine, Monif C, Full Figured Fashion Week and Ashley Stewart and was a key stylist for the Nate Berkus Show. Allen got her start in fashion in 1995 when she worked for Manolo Blahnik and she hasn’t slowed down since then. Marcy Guevara is a plus size expert and she isn’t just a stylist, she’s a television personality with an extensive hosting resume. 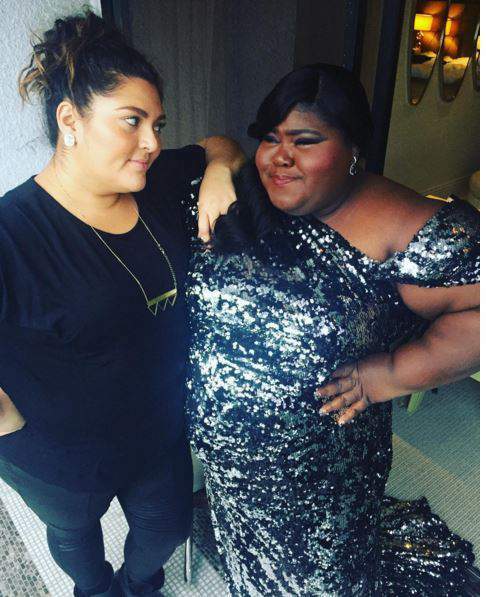 And when she’s not hosting or running her business The Plus Bus, she’s styling the amazing Gabourey Sidibe. Anyone who follows Sidibe on social media probably feels a bestie level kinship with her and Guevara captures her personal style perfectly; often drawing on custom pieces from both indie and mainstream designers. Boosting an impressive, 423K Instagram followers, GooGoo Atkins is a major name in plus size styling. She got her start by styling her older sisters Erica and Tina Campbell of Mary Mary. Atkins’ expertise helped establish Mary Mary as a group with “sass and class” and Atkins role on her sisters’ WeTV show earned her a loyal fanbase. She has also styled a number of other celebrities including Niecy Nash. Rivkie Baum is a UK-based stylist who has a long list of celebrity editorials and covers. She aims to fuse fashion with one’s individual style and her high fashion plus size editorials are truly breath-taking. Baum isn’t just styling for mainstream magazines, she also created the UK’s first plus size magazine, SLiNK where she flexes her style muscles in a major way. 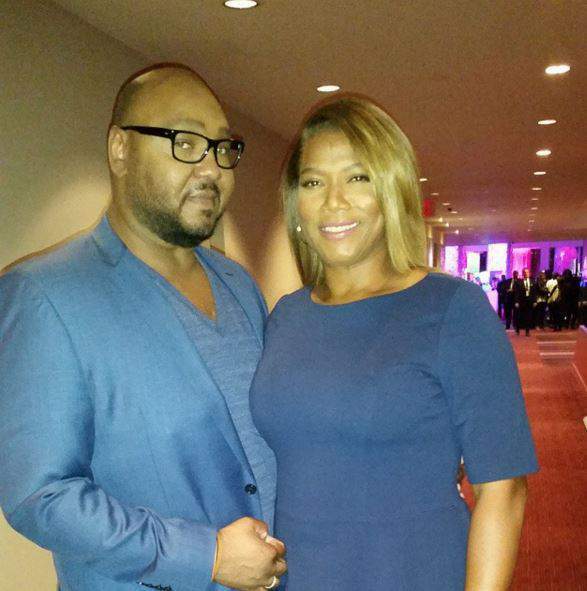 Timothy Snell was the stylist to the late great Whitney Houston and these days, his work has been all over the red carpet and the small screen thanks to his client Queen Latifah. He most recently dressed her flawlessly in Michael Costello for the SAG Awards. He appeared on her talk show and alongside her on HSN. Snell lent his expertise to the recent Torrid model search. Tiffany Kaelin Knight is the Editor-in-Chief of Skorch Magazine which has been plus size high fashion since 2006 on a digital platform. She has styled a number of creative shoots in her tenure as editor but my personal favorite is still the 2013 Clueless shoot. She has also worked as a stylist for makeup artist and beauty guru Patrick Starr. Did we get your fave? Did we miss YOU or someone you LOVE? Let us know! Next time you catch a plus size celebrity doing a TV appearance or strutting the red carpet, you may have a plus size stylist to thank for that fashion moment. Or if you know a plus size celeb looking for a plus size stylist or someone killing it in the plus size fashion arena, share this with them, so they know who is doing it! 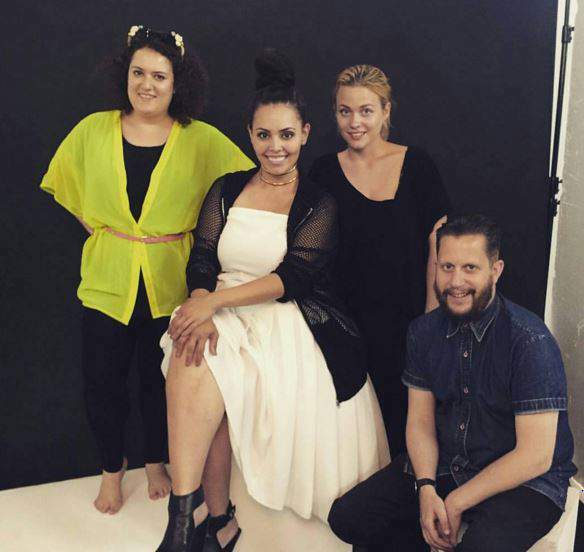 Around the Net: Your Plus Size News Roundup! The Who What Wear x Target Collection Launches Today and We Take You Inside the Launch Event! File under “Inspiration”! Love all of these ladies and gents!! !